STEELERS: Dangerous Without Bell..More Dangerous With Him | "IT'S A STEELERS WORLD"! Hypothetically speaking, let’s just say that Pittsburgh Steelers running back, Le’Veon Bell’s suspension is upheld. Which is seeming more and more likely since his appeal date has yet to be established, leaving him absent from the Week 1 matchup with the New England Patriots. Now, hypothetically speaking, let’s say that Patriots and documented cheater, Tom Brady’s suspension gets overturned. Something more likely to happen if NFL Commissioner, Roger Goodell has anything to say about it. So what. Because the Steelers have done everything this off season to improve from their 11-5 record from last season, while the Patriots have done nothing to continue their continued success. Basically because no one wants to be associated with the Cheaters that they are. Obtaining former Carolina Panthers running back, De’Angelo Williams in the off season was the Steelers doing what they do best..replacing cogs for the time being that may not be available. Also, to rid the sour taste of the LeGarrette Blount signing out of their mouths. Something I will touch on later after the Steelers victory in Week 1. Never mind Williams’ 62 carries for 219 yards and 3.5 yards a carry with 0 touchdowns, because the Panthers didn’t and don’t have what the Steelers have..coaching. With head coach Mike Tomlin’s continued improvement over the past couple of years since offensive coordinator Todd Haley’s arrival, Williams will definitely be utilized to the best of his abilities. “I’m a lot more comfortable than where I was last year,” Haley said. “That’s a good thing. We’re ahead of the game. We didn’t have any warning that was going to happen, in the midst of a season when we were practicing the guys who were playing. It was a little different situation. The ” Midst” of the season referring to Blount’s removal of himself from a game where Bell exploded for 200+ yards. 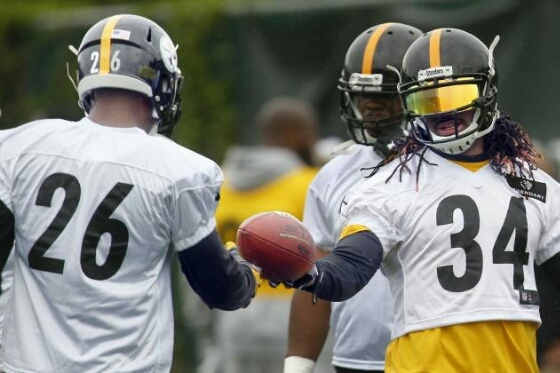 Not to mention along with DeAngelo, the Steelers also have second year backs Josh Harris and Dri Archer, who may make a name for himself on the KR this season according to sources. Long story short, whether Le’Veon Bell plays in Week 1, 2 or 3..the Steelers are preparing themselves to throw the counter punch. And whether Tom Brady is on the field or not on September 10, the Steelers pull out a 38-20 victory over the Patriots at Gillette Stadium.